Last week our duty vet was called out to attend to a kitten found on the roadside near Buck Barn. The kitten was approximately 12 weeks old, very thin and infested with fleas. Our nurses attended to his needs by giving him a bath and applying flea treatment and lots of cuddles. Despite all he had been through he remained bright and happy. The little chap purred constantly and was named Buck by the nursing team. Bruce a kitten owned by one of our clients was in for the day having treatment. His owners had previously lost Bruce’s playmate Diego to an incurable heart condition. They had arranged to visit Cats Protection to find a playmate for Bruce. 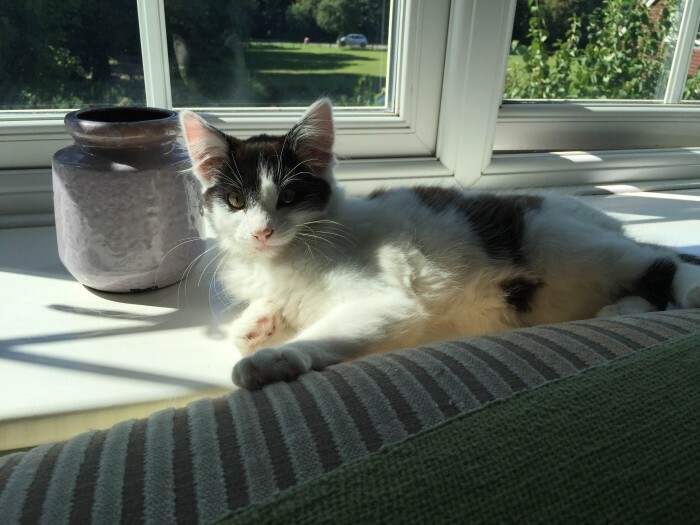 Yes, you guessed it – Buck the kitten is now in his new home and being extremely spoilt. He’s very happy in his new home, his ear scabs have gone and his lip is no longer swollen. No signs of any fleas or mites. We haven’t given him a proper name yet. He’s very friendly and he won’t stop padding the air! His purr is very loud too.